Fall has definitely arrived in New England. The trees are brilliant in MA, but already past peak in most of norther NH, VT and Maine. Still some good color out there though, and with temps in the high 20s at night (!) and low 50s during the day, there is a great smell and crispness in the air. Mike and I went up to the house in Bethel on Friday to check things out and ensure all was well, since we hadn't been up since August. Thankfully, the house is still standing, and we haven't [yet] been over-run by mice seeking warmer housing. It was definitely chilly though - temp on Sat morning was a balmy 27, and there was frost on the car. OK, so the REAL purpose of our trip was to go and race 'cross at New Gloucester. This is our 3rd year racing at this venue, and I can't say enough good things about it. I know that the schedule conflicted with Mansfield this year, but a visit to Pineland Farms for an excellent 'cross race should be on everyone's fall list of things to do. They've re-done the store/indoor farm stand and we found some yummy Maine-made salsas, honey and cheese to bring home with us. After debating about which races to do, we both decided on the Elite races later in the afternoon. That meant no "crack of dawn" wake up, which was really nice. 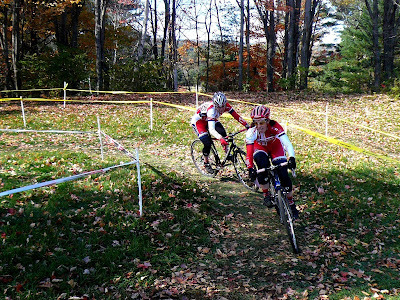 After arriving, I asked Mike to go out with me on the course to help me with all of the sections to have a better race. He gave some great tips, which really helped later on, although I did abandon my attempt at riding the run-up (I tried 3 times during warm-up and ALMOST made it). Because of the conflicting races, the Elite Women's field was small - 6 starters including Marianne, Linnea, Sue M, Susanne and myself (the 6th woman was unknown to all of us, and missed the start of our race, although she did go on to finish...). I had a terrible start, and was forced to chase down the high-speed pavement into the 90 degree right hand turn, but I caught on in time to see both Marianne and Linnea catch a little bit of air over the first hump before the barriers. What is it with me and starts this year? I can't seem to get going to save myself... I'm going to have to practice this in earnest before the next Verge race! I also flubbed going into the barriers the first time, dismounting WAY too early. From the photos, it looks like I took about 7 steps before actually getting over the first barrier. Mike was great, yelling at me to not get off so early - I listened, and nailed that section for the remaining 3 laps (YAY!). Barriers are another one of my weak points. I think I need to start making a list ;). I ended up racing with teammate Susanne for the entire race - the first two laps on her wheel (or chasing her down to get on said wheel), and then ahead of her as she had an unfortunate tip over on the off-camber dam section. With Susanne just behind, and seeing that I was gaining on Sue M each lap, it made for great incentive for me to keep on pushing through the whole race, trying not to get caught by Susanne, and trying desperately to close the gap to Sue. With one more lap, I think I may have caught Sue, but I think Susanne may also have caught me, as she finished right on my wheel. It was fun though, to actually be racing so close to other competitors - that doesn't always happen for me. The men's 1/2/3 field was also small yesterday - only 9 guys taking the line in a race that paid 15 deep. You do the math on that one ;). They were racing for an hour, which is 15 minutes more than Mike is used to, but he figured it was worth a shot. I was poised by the barriers as they came into the first lap, and watched with dismay as one of the riders overcooked the corner before, forcing Mike and Tom G to slide out to the side and into the tape. That put Mike in about 7th position right from the get go. As I waited for him to come back around, I chatted with Tim and Todd S who had both raced the 3/4 Master's race earlier, and were now playing pro-spectator. We were all surprised to see the leader come through, with Mike hot on his heels! This was exciting - Mike was in 2nd place in the 1/2/3 race, and while Brendan had a small gap on him, he also had a gap on Ryan K. As I chased around the course taking pics, this is the way the order stayed for a number of laps, with Brendan's gap slowing coming down. As I was making my way back toward the finish area, I was talking to my friend Ivy when I saw Mike come through AHEAD of Brendan! Unfortunately, Brendan had crashed and had trouble with his chain, putting Mike ahead of him in 1st place! Mike's lead on Brendan and Ryan continued to grow as the race continued. I cautioned him to ride smart (like he needs MY advice ;)), and he did, winning his first ever 'cross race! Ryan ended up passing Brendan in the final lap, and that was the order of the podium. Mike's down playing his win - he says that there weren't any big names there, it was a small field, etc., etc. But a win is a win! And between the two of us, we ended up coming home with over $200 in winnings for the day - guess we made the right choice on which races to do. Yeah for Mike! That is awesome!! I remember Pinelands! I did one of my first races there on my mountain bike. Yummmy bread in the bakery and I think I bought my windchime there. And again, your pictures are great. I don't think my camera is so great... I'll have to find out what your using. Thanx for cheering yesterday! Cough Cough sputter sputter... OUCH! It was fun though. I had an *unfortunate tip over* at the righthand turn up the little hill to the short barriers yesterday myself. LOL. Congrats to both of you on good races! ok..screw the sand and all the timid crap I do. I NEED to learn how to mount my bike properly and not stutter step. Example: like Alex is doing in that picture above but maybe not so dramatic. HELP! If you start from a standstill- just stand next to your bike, lift a leg, and hop on - eventually you'll be able to do it from a run. 1/2/3 Women - Register for MRC Race!